High speed, low- or high-shear mixers, inline blending and energy-efficient mixing are fairly commonplace in food processing plants today. But until recently, laboratory and pilot plants relied on more basic mixing gear. Now that is starting to change. "Our laboratory mixers have been developed in recent years to provide a high level of instrumentation and control," says Chris Ryan, technical author with Silverson Machines Ltd., Chesham, England. "A key factor in specifying a mixer is scale-up. Ensuring the results obtained in the lab or test kitchen can be replicated in production is vital." Just in September, another equipment manufacturer rolled out a new mixer designed for the pilot plant slot. The Ystral PiloTec processing system is the newest generation of Ystral induction, mixing and dispersing equipment bringing established production processes to a pilot plant, laboratory or smaller-scale production environment. Powder Technologies Inc., Hainesport, N.J., exclusive distributor of Ystral powder and liquid processing systems throughout North America, offers the PiloTec as one of its solutions for processing applications in several industries including food processing. The company says the PiloTec offers dust- and loss-free powder induction, wetting under vacuum and dispersion, all in one passage. A simple exchange of mixing tools also allows innovative Multi-Z- or Z-Inline-dispersing with multi-stage shear ring systems. Of course, scale-down is not the only improvement of late in the mixing and blending arena. Ken Langhorn, technical director for Charles Ross & Son Co., Hauppauge, N.Y., notes that another design innovation is the development of ultra-high shear mixers like the Ross X-Series. That line is now being used in the production of food emulsions. Running at top speeds over 11,000 fpm (compared to the 3,000-4,000 fpm maximum tip speed range of traditional rotor/stator mixers), the X-Series presents a more cost-effective alternative to colloid mills and high-pressure homogenizers. 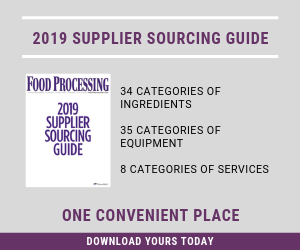 "Changes like this in mixing technology are driven by the manufacturers' need for higher efficiency, easier clean-up, faster changeover and of course consistent food quality," Langhorn says. Other key considerations when selecting mixing equipment include clean in place (CIP) capabilities and hygienic design. As food manufacturers are now working under more stringent food safety regulations, these concerns are more important than ever. "These days the food industry is specifying equipment to the same standards as the pharmaceutical sector," Ryan says. "It is becoming the norm to meet demands for equipment conforming to the regulatory bodies and standards such as FDA, 3-A, cGMP and, in Europe – and increasingly throughout the world – EHEDG. "One of the major changes in approaches to mixing is the increasing use of in-line mixers rather than in-tank machines. These in turn are evolving, with the use of multi-stage units providing ever-higher shear rates becoming more common." In-line mixers are by nature far more hygienic, having a minimized number of product contact parts, and they are generally designed for cleaning-in-place (CIP). Advances in sanitary construction have led to the introduction of mixers suitable for sterilization-in-place (SIP). Langhorn says food manufacturers are always seeking equipment that allows for quick changeover and ease of maintenance. He notes too that top suppliers like Ross are involved in installation and invite customers to testing centers where the efficacy of systems in particular applications can be demonstrated before installation. Another recent introduction from Powder Technologies is the Ystral Conti-TDS, designed to offer powder induction, wetting and then dispersing of an agglomerate-free liquid, all with one machine. Induction rates up to 800 lbs./min. and shear speed up to 100 ft./sec. with shear gradient 50,000 sec.